It all started in 1972 when I went for a pee and nothing happened. I have been living with multiple sclerosis since 1972. In 1979 I was 25 when my bladder involuntarily emptied itself, totally embarrassing. The problem went away and I just carried on with life, I’m sure MS would not have been diagnosed in those days. The cause was double vision. Six years after my diagnosis of RRMS my MS evolved into Secondary Progressive MS. That was in 2000. From then on it was a gradual but steady change or decline and it was now affecting more and more aspects of my life. Quite suddenly I had to take medical retirement, that was in January 2012 It was then that I started the website and blogging. This is about me, Patrick Burke. My life, climbing up a mountain, surfing on a wave. No chance now but back in the day…. There is no red book, no prizes but I am alive. I hope you ENJOY. I participated in the ASCEND trial, a 2 year phase 3 trial using Tysabri for people with secondary progressive MS. The aim of the trial was to find out if Tysabri could reduce progression of MS. The trial was not a success however the #ThinkHand program by the Barts MS group grew out of this trial. What is it like when your life is dominated by your totally unreliable bladder. Very very occasional relapses start to become more frequent. What is happening, quite suddenly there is the burning desire to go to the loo and it won’t go away. Slowly the problem get worse and worse. Fampridine is a drug that has been shown to improve walking speed for some adults with multiple sclerosis. It was licensed in 2011 but is not available on the NHS. It works by stopping potassium leaving nerve cells which have been damaged by MS so letting signals pass down the nerve more normally. Consequently, some people are able to walk better. I suffer from foot drop, a very common problem for people who have multiple sclerosis. In December 2014 I replaced my Musmate and orthosis with an FES, functional electrical stimulation. An FES is a device that sends an electrical impulse to a nerve that is not stimulated by the brain. The MS damages myelin on the spinal cord and because of the damage no message will stimulate the muscle. An external device provides the stimulation. This tells how MS can change people’s lives and its impact upon people. 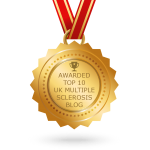 The blogs provide an insight into living with MS.
Patrick’s Blog gives you some idea of what my life is like. It’s a personal blog. Stories of my own life recording the ups and downs of living with MS. In December 2015 I started on the MS-SMART trial. This clinical trial will test the effectiveness of 3 different existing drugs at slowing down disease progression. The drugs in the trial are Fluoxetine, Riluzole and Amiloride. This is a phase II trial. Taking exercise is very important to me. While I still can I do a couple of short walks each week with my rollator, only a few hundred metres. Each year I do a much bigger, something in the region of at least one kilometer.